Legend says that turquoise brings the spirit of the sea and sky together to bless the wearer of the stone! 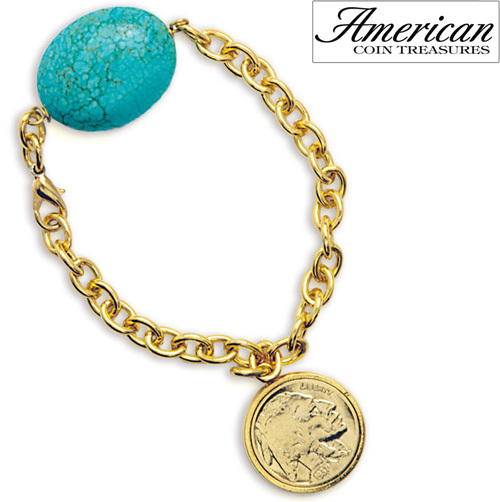 The Gold-Layered Buffalo Nickel Bracelet with Turquoise Stone is fashioned with an open link 24K gold-layered 8 inch chain! The turquoise stone measures approximately 3/4 inch and has a beautiful matrix. The 24K gold-layered Buffalo nickel minted between 1913 and 1938 is secure in a 24K gold-layered bezel. A Certificate of Authenticity is included.